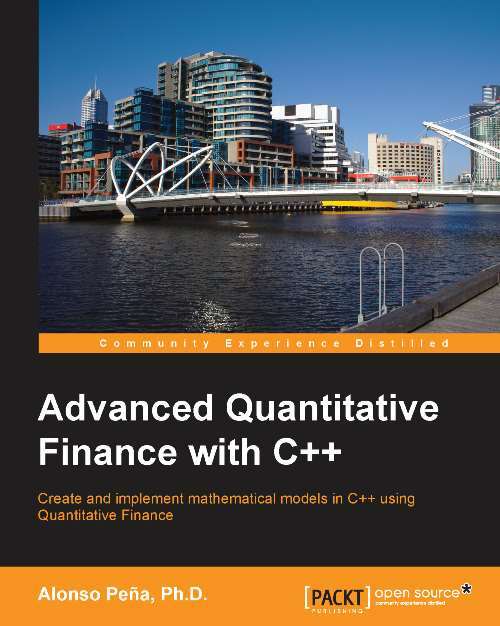 Today, I have finally found some time to finish the reading of Advanced Quantitative Finance with C++, a book provided to me kindly by Packt Publishing. So, what the book says? Pretty much, it uses C++ for mathematical modelling. The modelling is done in a free environment – Code Block, which is really good functional free environments. Is this book for you? If you are a financial guy, who has done some mathematical modelling with Excel and no programming experience – I am sorry to disappoint you, this is not your book. It would not teach you from the start to code in C++, on the contrary the book is for people with some background in coding. If you are a guy, who can write in OOP language and you want to understand how Quantitative Finances work and more about it – then you probably found a good match! The book starts with a brief explanation on Quantitative Finance and continues to introduce Mathematical Models. In Chapter 3 we have some good presentations of the basic three key numerical methods for price financial derivatives – The Monte Carlo simulation method, The Binomial Trees method and the Finite Difference method. The methods are explained quite well with examples. After the explanation of the methods, we start the coding process. Thus, if the book should be divided into two equal parts, the first one is a brief introduction in Quantitative Finances (about 50 pages) and the second one is examples of solving real financial problems with mathematical models in C++ (another 50 pages) with a console application. In the second part, we have the source code of 8 examples, which are taken from the real world. Once again, if you are a financial guy hoping that you will be able to understand C++ and use it in your daily work after the reading of this book – you are wrong. You need an entry-level book to get you acknowledged with the C++ programming world, as in this one the given code is really not explained. Anyway if you have coding experience and you want to enter the financial world, the introduction part of the book can be quite useful and the second part of it can provide some good ideas for console model building with C++.